Damaged recordings… By that I mean just about any CD from the past 20 years, and typical Web playback recordings. You know the disappointment of hearing a great movie soundtrack, then ordering a CD of it, only to find grotesquely compressed tracks lacking all the lifeblood of dynamic range. Those are damaged recordings. So is there anything to be done? Once you throw information away, you can’t get it back, right? I got started in earnest with image processing shortly after the launch of the Hubble Telescope, when it was found that the contractors responsible for grinding the primary mirror had goofed and shaped it ever so slightly wrong. The Hubble telescope became a 100 M$ fiasco almost immediately. Gross amounts of (mostly spherical) aberration in every image. But scientists got to work and looked for ways to mathematically correct the images coming back from a flawed sensor. And we found many good ways to do this – it takes massive computing power. All this was “fixed” after a Space Shuttle mission to add a “contact lens” to the Hubble and correct its aberrations. The spillover from all that work has led to improvements in medical imaging for CAT and MRI Scans, and to some degree, in audio processing. So I went looking for what recent developments might be able to re-inflate the dynamic range from hyper-compressed recordings. I found one thing so far, but I haven’t finished looking. But I’ll tell you about this thing. You can download a version for yourself here. Tony Bongiovani has some serious audio credibility as the founder and manager of the NYC Power Station recording studio. Apparently he is a legend in the industry. But he claims to “understand human hearing” and has designed his DPS technology to overcome the flaws in headphones and speaker systems, as well as leveling music across the important frequencies for our loudness perception. He also claims it is patented technology. Okay, patented… I worked on the side for a while helping a local Patent Attorney write his technology patents, as well as spending several years writing and obtaining my own audio patents. What does “patented technology” mean? Well, the poor patent office is so overworked and inundated with patent applications that they routinely deny every application submitted. But if you persist, and get your forms in order, you will probably be granted the patent unless it has obvious flaws. They leave it to the courts to decide on patent validity when / if a patent is ever challenged. Now, if a patent is really worth something, it very likely will be challenged in the courts. So you’d better have some deep pockets to weather a defense against some big guns on the other side. The moment a Sony or a GM decides to take on Tony Bongiovani he will likely wither and fold, and the patent will be trashed. But Tony has licensed his technology (or some portion of it) to big gun car makers. Why didn’t they just take him out? I think they decided that having Tony’s personal guidance about how to shape sound was worthwhile, and any attempt to steal his patents would be counterproductive. I read his patents. What he claims is a relatively simple 3-band compression scheme, by today’s standards. But he developed these techniques over many years of experience at his recording studio. He garnered a number of awards for his mastering. And his personal knowledge about where to place the cross-overs, how much compression to use, what makeup gains, and so on, are really worth knowing. That’s the only “magic” I can find in his DPS technology. So enough hot air… make some measurements and look at the evidence. I did that. At first you have to be prepared to make some corrections. When setting up the DPS, assuming you got all the connections right, you will hear a difference between on / off DPS processing. The difference is really striking! But beware… unless you loudness normalize the sounds, it is impossible to make proper subjective comparisons. There are no meters on “sound quality”. It is a purely subjective assessment. And the louder sound wins, no matter what – even if the level difference is imperceptible. The top trace shows the original track, where the effects of compression and limiting are apparent. The bottom trace shows the renormalized DPS processed track. 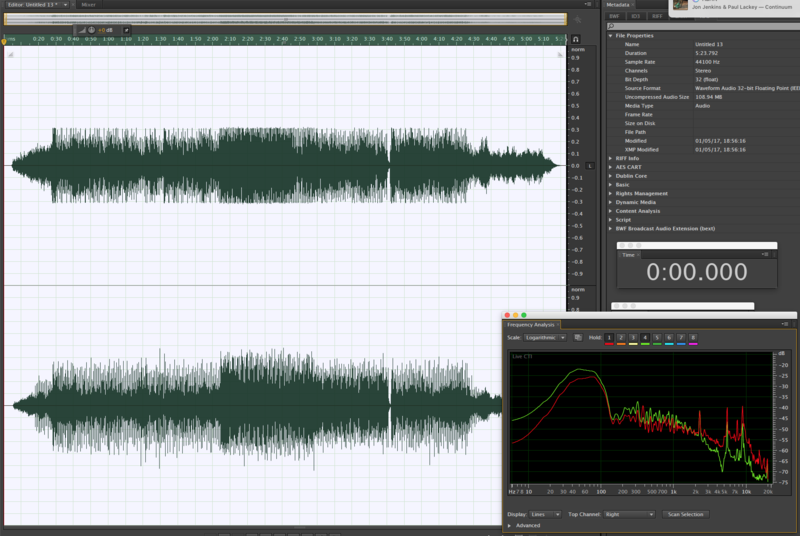 The spectrogram shows the average over the tracks, with green as the original, and red as the DPS processed result. So you can definitely see that the DPS process restores some amount of lost dynamic range in the music, at least insofar as peak excursions go. It boosted the highs a bit, and lowered the bass a bit too. But is that what we really mean when we say “dynamic range”? I don’t think so, not entirely. Dynamic range also has to do with loudness variations. A pp section is not the same loudness as a ff section, regardless of their peak excursions. And here is where DPS doesn’t restore dynamic range. In fact, it does an apparently “better” job of keeping the “important frequencies” leveled. But does it sound better? I think it does. But there are a number of sound shaping presets to choose from. You have to choose whichever sounds best. I chose one that seemed most neutral in my Sennheiser HD650 headphones. There are others that sound very bass heavy or treble heavy. There isn’t a selection for my particular headphones. But different always sounds better too. So you can only tell if it really sounds better after listening critically for many hours. On that, the jury is still out. DPS seems to be winning, but only time will tell.